Jeremiah Traeger, contributor here at ATP, has kindly reviewed my fiction book Survival of the Fittest: Metamorphosis (UK readers) and posted it on Amazon. Here is the review. Grab yourself a copy for some winter reading! 5.0 out of 5 stars Zombies, comedy, and theology? It drops you in focusing exactly the type of people you would expect to avoid such an outbreak. A few characters are societal-shut ins, and a few just happen to be enjoying nature and escaping civilization precisely when an apocalypse spreads everywhere. The perspectives shift throughout the book among various people slowly realizing they are survivors of a massive catastrophe that seemingly guts 99% of the planet, and eventually the characters are forced to deal with their problems in a very physical and often bloody manner. There are, of course, the standard storytelling elements inherent to a zombie survivor story. You also get a pleasant additional blend of humor and introspection among the characters. Two of my favorite characters are Jason and Bev, who pepper their gruesome journey with buddy-comedy humor that brings levity to a couple of friends on the road. Of course, this levity is framed around a civilization-ending plague, and eventually over-the-top gore. Pearce’s philosophical background shows in the conversations between characters as well as their internal desperate deliberations. As he is well-versed in theology, it is no surprise that a few people he focuses on are evangelists seeking to spread the good news of Jesus Christ. There’s a bit of irony that conversions into zombiehood are much more reifying and (in this universe) likely to succeed than conversions into Christianity, and I can’t be surprised at seeing some of the comparisons made considering Pearce’s atheism. I couldn’t help but laugh at one character’s contemplation over the problem of evil in one of the most desparate and terrifying situations imaginable. At points, the violence is so over the top, it seems like nature occasionally becomes a sardonic mistress that gets an Evil Dead like kick out of watching people try and escape a cruel and violent fate, far from some benevolent and loving creator. 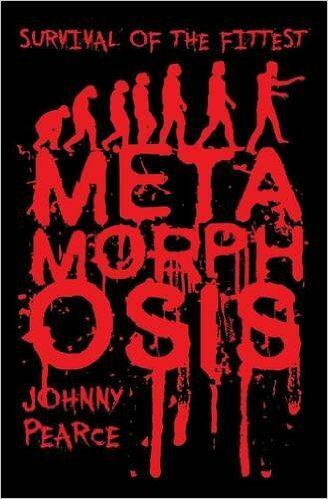 For a read with a tense buildup with characters confronting a realistic societal and technological fallout, contemplating genuine dread and authentic panic, topped off with all the fun and violence you should want from a good zombie story, definitely check out Survival of the Fittest: Metamorphosis. I am working on the sequel as we speak, but have been delayed by other projects and life in general (such as my recent MS diagnosis). A book I have just completed and am tinkering in the editing process with is The Curse of the Maya – a book aimed at younger audiences. I am writing it with an ex-colleague of mine and good friend/Tippling Philosopher, Andy Loneragan. The book is being proofread and read by some of our target audience (“brilliant” and “goosebumps” – feedback is awesome). There is a lot for the questioning mind in the book as the two twins in it differ in their worldviews – they are a sort of younger Mulder and Scully. Lots of P4C – Philosophy 4 Children – packed subtly into the pages. After the Maya book is out, The Survival of the Fittest: Adaptation book (sequel) will quickly follow. Thanks to JT for enjoying and reviewing!